NOW: I would have liked to have started sooner, but I had Staff Development Monday and Tuesday, we went to the zoo with Papa B on Thursday, we had a graduation party Saturday, and a Fourth-of-July party on Sunday (yes, I know it was the 3rd of July). So we’re starting on Independence Day – how appropriate. BIG KID UNDERWEAR! We’re diving right in. The twins are not strangers to the potty. We’ve actually had the potties since February. But we haven’t really been training with any consistancy. If we need to change their diapers, we’ll put them on the potty while we’re there. We put them on before bath. But that’s about it. Sometimes they will ask to go to the potty, especially now that M&M’s are involved. Ariel especially is interested in the M&M’s (she’s my daughter all right!). 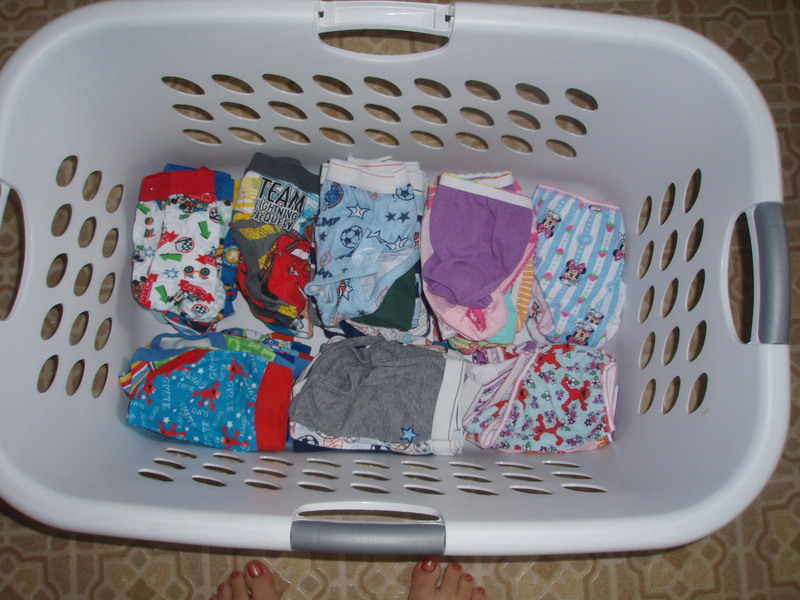 But, now that Mommy is off for the summer, and we have piles of Big Kid Underwear, we’re ready to go! We’re just going to put them in the underwear and see what happens. I know they’re not even 2 yet, but they are very interested in the potty. They love to watch Tim and I go potty (no shame here). They love to help get toilet paper. They love to flush. They love to wave bye-bye to the pee-pee or poo-poo. They love to wash their hands. And….they HATE having wet/dirty diapers. Especially Will, who seems to have sensitive skin. I figure if we’re outside, and they have an accident, it’s no worse than what the dogs are putting on the lawn. Plus, we have a hose. It’s not like I’m throwing all of our diapers away, either. If we get sick of it, or it’s not working out, we’ll just go back to diapers….and just put them on the potty every hour or so to get them more used to it. But (for now) I kinda like the idea of getting them out of their comfort zone in hopes that this will make them realize when they need to go potty. A lot of articles I’ve read on the subject said to have them pick out their own underwear, and this is the first question I’ve been asked lately when I’ve told other moms my plan. I didn’t do this. I know what they like (Elmo and Mickey/Minnie), and I just bought them a couple packs of “cool” underwear and the rest “plain”. I also got some new shorts to have handy. I wrapped up the cool underwear in gift wrap and after they open their gifts, we’re going to have a POTTY PARTY!!!!! Wish them luck! This is now. Question: How did you/how will you potty train your kids? THEN: My pregnancy was one of the best times of my life. I couldn’t wait to be pregnant and when I was, I just enjoyed every minute of it. (Besides the sleeping/lack of sleeping, but that’s another day). There was only once that I kind-of-almost-really-super-duper-regretted getting pregnant, being pregnant, and, especially, the drugs I used to get pregnant. I was at school (I’m a teacher) and it was the year I taught third grade. (I’ve jumped around quite a bit). It was twoards the end of the day. There was a teacher’s aide that worked across the hall from me in the copy room. She was my savior – I would pop over, she would watch my class, I could go to the bathroom!!!! If you’re not a teacher, you don’t understand what it’s like to not go to the bathroom especially when you’re pregnant. Anyway. I wasn’t really feeling well. I had eaten normally, it was only April, so I wasn’t huge yet. It was hot though, hot for April anyway. I was uncomfortable. I really really needed to go to the bathroom. For a while. Now, not only is my belly upset, I’m sweating, but now I’m paranoid that something’s wrong with my babies. So, I pop across the hall. Let me pause and tell you about Marilynn. She was my at-work mommy for a while. Not only would she run to my room to watch my kids, knowing when I had to “go”, but she just looked out for me in general. I was supposed to get eggs as part of a science unit. We incubated them and they hatched into chicks. She called me one morning, all in a panic, telling me I needed to call the Science department right away before the eggs came! Why? She wasn’t sure it was a good idea to have them in my room while I was pregnant. She was very worried. If I didn’t call, she would. I called, they said it was fine. She was relieved, but also told me SHE would handle them if necessary. So, it also smelled a little funny in my classroom because of the baby chicks, who had hatched by then. I ran over to the copy room, she took one look at my face and knew something was wrong. “I just don’t feel good”, I told her hurriedly. I didn’t even wait for her to get to my classroom before sprinting to the bathroom. Once there, I was doubled over in pain. My stomach felt like it was going to rip apart. I went to the bathroom; it didn’t help. I made it back to my classroom, because I had to. I told Marilynn about my problem. She said I better ask my principal if I could leave right after buses. And I needed to call the doctor (still at the fertility clinic) right away. If I didn’t call, she would. She ignored my protests, “no, I’m fine”, “we have a faculty meeting today”, “I’ll wait and see if I feel better when I go home and lay down”. She forced me to call the doctor. While waiting for him to call me back, I told my remaining students (it was dismissal time by now) that I really didn’t feel good. I put my head down on my desk and rubbed my aching mid-section. What was wrong? Something horrible? Were my babies ok? Was I ok? I tried to tell the twins through my thoughts that they were ok, it will be ok, you’re ok, Mommy’s ok”. I hoped they were telepathic. Doctor called back – come in to the office – but it’s probably **just** a burst follicle. Really? This is the worst pain of my entire life……but yes, I will come in, just to be safe. Wait. Tim is out of town on business. I didn’t know if I had a ride. I will call back. They said they would wait for me. I obviously sounded panicky. I got permission to leave after my class was gone. Several people I passed offered to give me a ride home. No, I just needed to be by myself. I considered it though, wondering if I could/should drive. But I live very close. I made it home. On the way I used my (hands-free) phone to call Tim and leave a message asking what I should do. The doctor didn’t seem worried. Tim didn’t answer, so I left a calm (?) message. Then, I went in and laid on the couch, because I was convinced this would be the trick. I almost fell off of it because I was literally writhing in pain. I called my dad and mom – could they come and get me, nothing to worry about, just the worst pain of my life, no big deal, everything’s fine, I just need to go to the doctor. I had to hunt them down on their cell phones. They were kind of far away, but they got to my house in about 20 minutes. The doctor said they’d wait for me to get there even though it would be after closing. By the time my parents got there, it was no longer the worst pain of my life, but it was still bad. And I was still worried. They insisted I go, even though I said I didn’t need to. I sat in the front. I could barely keep my eyes open, I was worn out from the pain. When I got there, the nurse and the doctor ushered me into the back for an internal sonogram. Yes, *just* a burst follicle. It might be sore for a few more hours. Babies were fine. I was fine. Just a burst follicle. Just the worst pain of my life, over. I think I walked around on my tiptoes for the next few days…..just to make sure nothing got jostled, put out of place, or burst. But, the worst pain of my life, the only “bad” thing of my pregnancy, was over. That was then. That must hace been terrifying. Even though we know the story has a happy ending, I found myself holding my breath for you. So glad it was “just” a burst follicle. Good luck with the potty training! Much like you, I bought the big boy underwear myself (Spiderman and Scooby Doo!) and that was just fine, I love the idea of a potty party, and it sounds like your two are ready for it. 🙂 I also just put my boy into his underwear and let him go for it. Yes, we had some accidents, but it really only took a couple of days for him to be “trained”. He hates being “messy”, too. Thanks! That’s a great suggestion for “throwing out” the diapers. I think I will try that too. We watched an Elmo Potty Video, so I keep referencing that, and how Elmo doesn’t need diapers anymore. LOL! The only thing I’m worried about now is that they don’t seem to be able to tell before they have to go. But, I’m certainly going to stick with it!